This case was brought to my attention by a friend whose friend gives him this wonderful huge avocado. I asked him for a picture and after I saw it, I was interested. First question asked was if it was planted from a seed, after a positive reply I went to the house to see the fruit and the tree. As you can see from the picture is a nice huge fruit. 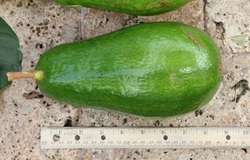 Seems to be an early variety since they have been picking avocados for 6 week and I was there the last week in August. The tree looked like a 12-15 year old tree but I was told is was only 7 years old, so it is a robust growing tree. Seems to be alternate bearer since last tears produced more that the current year. The tree and fruit seemed clean, no decease. Uncertain of fertilizing practices. This variety have been named "El Pipe", that is the owners nick name. El Pipe tells me that he planted the seed of a huge, long avocado that his brother got from a house in Coral Gables, From the description could have been a Russell or a Wilson Popenoe. He planted it in the ground a few years latter the tree was producing this wonderful fruit. I will taste the fruit in a few day and post my comments. I will probably grow this tree to see how it produces under normal agricultural practices. The tree seems to have been a bit crowded at its present location. The taste of the fruit makes me believe this is a Russell seedling. Russell is not my favorite fruit. I find El Pipe teste a bit better than a Russell. The seed also gives you an indication it is a Russell seedling.